Anyone who uses the Milton Coop will have met Rosie Dodds, one of many cheerful faces behind the counter. 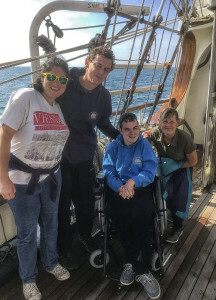 Here Rosie tells of her voyage on an iconic tall ship. If you are 18 to 90, able bodied or disabled, looking for a challenge, and to have memories that last forever, look no further than www.jst.org.uk. Tenacious and Lord Nelson are three-mast square-rigged tall ships and I have sailed on Tenacious five times now. The Jubilee Sailing Trust is perfect for an adventurous journey for a daughter who wanted a holiday without needing to depend on her family. There is a nurse on board the ship who can help if needed. On the morning of 1 September, my parents and I set off to Dartmouth to catch the tall ship Tenacious whilst the royal regatta was on. We saw many boats small and large; one boat looked like a small hut. Many people were catching crabs on the side of the River Dart. There were activities for all ages that got the bay buzzing. When it was time to leave the shore for the ship we were grouped together in a small boat as we were anchored in the River Dart. When the crew of 51 was all together, we went down to the lower deck to have our photographs taken, get our watch cards, have safety briefings and meet the permanent crew. Darren was the captain and Rocky was the Bosun’s mate. He, along with the other permanent crew, were really friendly and the crew felt that we could have a laugh. Once Tenacious was secure and the washing up finished, we were able to explore Dartmouth a bit, so my dorm which consisted of Emily, Anna, Fi, Ellie and I went to the pub to have a few drinks. On our way back I stopped off at a freshly baked doughnut hut; I shared them with my new acquaintances. We then went back to the ship to watch the magnificent fireworks which were on a barge in the middle of the Dart. On 2 September, I was at the helm when we left Dartmouth behind. The sea was rippling and very calm. We couldn’t have asked for better weather. We managed to climb the rigging. When we anchored off the Jurassic coast we were able to jump off the ship into the sea. It was quite salty but what an exhilarating experience. In the morning when we were trying to sail on to Portsmouth we managed to get tangled in a fisherman’s net. It was a short voyage but it was the best crew that I have had the pleasure to set sail with. I hope to go on another voyage next year.